TORONTO, June 20, 2017 – According to the 2017 Royal LePage Canadian Recreational Housing Report released today, the majority of recreational property markets across Canada have seen year-over-year price and sales volume increases, although in a number of regions, trends differ markedly. While recreational property trends remain mixed in the majority of oil-producing provinces, high-priced competitive environments have intensified in British Columbia and Ontario’s recreational segment, with characteristics stemming from Greater Vancouver and the Greater Toronto Area emanating into the provinces’ recreational markets. Nationally, the report, which compiles information from a cross-Canada survey of the company’s recreational property specialists, found that recreational property prices increased in the majority of regions in the month of May, with nearly two-thirds (63 per cent) of advisors stating that prices have jumped year-over-year. For the same period, over half (58 per cent) of respondents have seen a year-over-year increase in sales volumes in their area, coupled with 54 per cent who reported a drop in inventory levels – putting further upward pressure on prices, particularly in a number of areas in Quebec, Ontario and British Columbia. Looking ahead, the majority of respondents (54 per cent) expect sales activity in their region to rise this year when compared to levels achieved in 2016. As of May 2017, the national aggregate price of a recreational property in Canada was $439,000. However, when broken down, there were noticeable price differences from coast to coast. Of the regions studied in the report, the most expensive properties were found to be in Western Canada, with Alberta topping the list with a provincial aggregate price of $816,700. Prices in the region were driven primarily by the province’s limited availability of lakefront property in close proximity to major city centres, and an increase in demand stemming from an uptick in the energy sector and consumer confidence. On the opposite side of the country, the least expensive recreational properties were found in New Brunswick, with a provincial aggregate price of $179,500. Within the province, buyers could fetch a lakefront property near Fredericton for a mere $86,700 – roughly 6 times less than what one would expect to pay for the same property type on Canada’s westernmost coastline. “As seen in other home segments, price differences for recreational properties from region-to-region can vary quite remarkably,” said Somers. “What remains relatively consistent across the country is that demand within many recreational markets is very much alive, with communities seeing an emergence of new builds and homes designed for multi-season use. Buyers are seeking properties that allow them to maximize their time away from the bustle of the city, often with the plan of making the home a primary residence in the future. “The lifestyle of a home surrounded by the striking beauty of lakes, forests or mountains enjoyed with loved ones is an irreplaceable experience, and one that remains part of the Canadian dream for many,” added Somers. 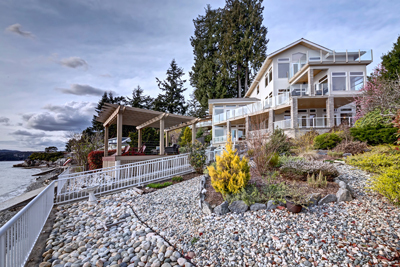 The high-priced competitive environment seen in the Greater Toronto Area and Greater Vancouver residential real estate markets have seeped into the provinces’ recreational property segment, putting upward pressure on pricing and sales activity levels. According to over three-quarters (78 per cent) of Ontario and British Columbia advisors surveyed, prices in the recreational property areas they service have been influenced by the neighbouring Toronto or Vancouver real estate markets. The same proportion (78 per cent) stated that these markets have also impacted sales volumes in their areas. “The radiating heat of the Greater Toronto Area and Greater Vancouver real estate markets has been flowing beyond the boundaries of the suburbs and nearby cities, to reach what have traditionally been recreational regions,” Somers explained. “Many cottage communities in Ontario and B.C. have seen unprecedented levels of sales activity and property price increases, driven largely by Toronto and Vancouver city-dwellers leveraging their home equity to purchase a recreational sanctuary – often with immediate or future retirement in mind. “In some areas, recreational properties are seeing multiple offers. This situation is a rare phenomenon among cottage transactions, as the sales process can often be very protracted,” continued Somers. “Despite the introduction of new governmental policies slightly slowing the market, we expect sales activity within both provinces to continue to grow for the balance of 2017, as demand from Gen Xers and Baby Boomers, determined in their lifestyle aspirations, are met with limited property inventory in the most desired regions,” concluded Somers. According to roughly two-thirds (65 per cent) of respondents, many retirees across the country have increasingly begun to look to cash in on their home equity and purchase a recreational property as their primary residence. These purchasers will often hold onto the property for a number of years until they can no longer keep up with its associated maintenance, either passing it on within the family or selling it, and downsizing. While this tends to be more prevalent in provinces like British Columbia and Ontario, where home values are generally higher than the rest of the country, the trend can be witnessed nationwide, including in Alberta, Quebec and New Brunswick. In looking at buyer profiles, the majority (60 per cent) of advisors identified Generation Xers (36 to 51 years old) as the leading purchasers of recreational properties in Canada, with Baby Boomers (52 to 70 years old) following at 40 per cent. The family status of a typical buyer is a couple with children, according to nearly three-quarters (71 per cent) of respondents. Desired lifestyle and vacationing was by far the top cited (87 per cent) reason for purchasing a recreational property, followed by retirement (62 per cent), being at a point of financial security (54 per cent) and purchasing the property as an investment (52 per cent). Meanwhile, respondents cited owners getting older (90 per cent), the property going unused (79 per cent) and not being able to keep up with property maintenance (60 per cent) as the most common reasons for selling. Over three-quarters of respondents (77 per cent) stated that foreign buyers account for 5 per cent or less of recreational property purchases, with 85 per cent stating that the number of foreign recreational buyers has remained unchanged since last year. Drawn to the north’s astounding beauty and attractive exchange rate proposition, Americans have consistently been the largest cohort of foreign nationals buying Canadian recreational properties. When asked to compare the number of U.S. recreational property buyers seen this year over last, nearly three-quarters (73 per cent) of respondents said that the number has remained the same. Yet, advisors in British Columbia, Quebec, Newfoundland and Labrador and Prince Edward Island reported seeing increases in U.S. interest. As of May 2017, the aggregate price of a recreational property in British Columbia was $595,100, with real estate advisors in the region seeing strong recreational property price increases when compared to 2016 values. Sales volumes across the recreational property markets studied have also increased year-over-year, which is expected to continue in the remaining months of 2017. Click here for more information on the British Columbia recreational property market. Alberta recorded the highest provincial aggregate price in the country at $816,700. When asked about year-to-date price trends, advisors reported mixed results, with some witnessing year-over-year price increases near major city centres like Calgary and Edmonton, while others around major oil-producing cities, like Red Deer, reported declines. Looking ahead, recreational property advisors in the region believe sales volumes will increase by year-end – with transactions starting to pick-up in light of improved weather and renewed economic optimism in the province. Click here for more information on the Alberta recreational property market. In Saskatchewan, the aggregate price of a recreational property sat at $297,200 in May 2017, with year-over-year price and sales activity trends varying depending on the region. Looking ahead, regional advisors expect sales activity to increase or remain flat for the balance of the year pending local market dynamics. Click here for more information on the Saskatchewan recreational property market. Manitoba recorded a provincial aggregate price of $238,600 for recreational homes, with advisors in the region seeing prices so far this year remaining relatively flat year-over-year. Sales activity levels for cottage markets in the province have also remained relatively flat, a trend that is expected to continue for the balance of the year. Click here for more information on the Manitoba recreational property market. In Ontario, the aggregate price of a recreational property was $413,000. Buoyed primarily by strong buyer demand from the Greater Toronto Area, and coupled with a decreasing number of listings, many of the province’s cottage regions have seen significant price appreciation and increasing sales volumes so far this year, when compared to 2016 levels. Looking ahead, recreational property experts in the region expect to see a strong trend of increased sales activity, most of all through the summer months. Click here for more information on the Ontario recreational property market. Quebec’s aggregate recreational property price reached $318,700 in May 2017, with prices this year increasing or remaining flat depending on the region. Sales activity levels were relatively modest across most cottage regions, which can be explained primarily by a noticeable decrease in inventory in the province. Looking ahead, real estate advisors expect sales activity levels to remain stable for the remainder of the year. Click here for more information on the Quebec recreational property market. The aggregate price of a recreational property inNova Scotia hit $260,700, the highest of any Atlantic province, showing a year-over-year price increase from 2016. So far, recreational property sales volumes have remained flat year-over-year, which is expected to continue for the remainder of 2017. Click here for more information on the Nova Scotia recreational property market. New Brunswick posted the lowest aggregate recreational property price in the country at $179,500. Outside of major city centres like Fredericton, real estate advisors in traditionally smaller recreational markets are observing year-over-year increases in price and sales activity levels, with sales volumes expected to rise further in the year ahead. Click here for more information on the New Brunswick recreational property market. Also among the most affordable regions in the country, the aggregate price of a recreational home in Prince Edward Island reached $225,500 in May. With a wide array of options, and steady demand from Canadian and international buyers, recreational property prices and sales activity levels have seen slight increases so far this year, compared to 2016 levels. Click here for more information on the Prince Edward Island recreational property market. In light of a dampened energy sector and continued economic uncertainty, price and sales activity levels have declined year-over-year across Newfoundland’s recreational property segment, which sat at an aggregate price of $191,700 in May. Looking ahead to the remainder of 2017, real estate advisors in the region expect continued declines in sales volumes across the province. Click here for more information on the Newfoundland recreational property market. The chart below provides the aggregate price of a recreational property, across regions and property types studied, for each province. The chart below provides average 2017 prices across Canada for six recreational property types studied in the report including lakefront, riverfront, oceanfront, island, woods cottage/cabin, and resort/condo.